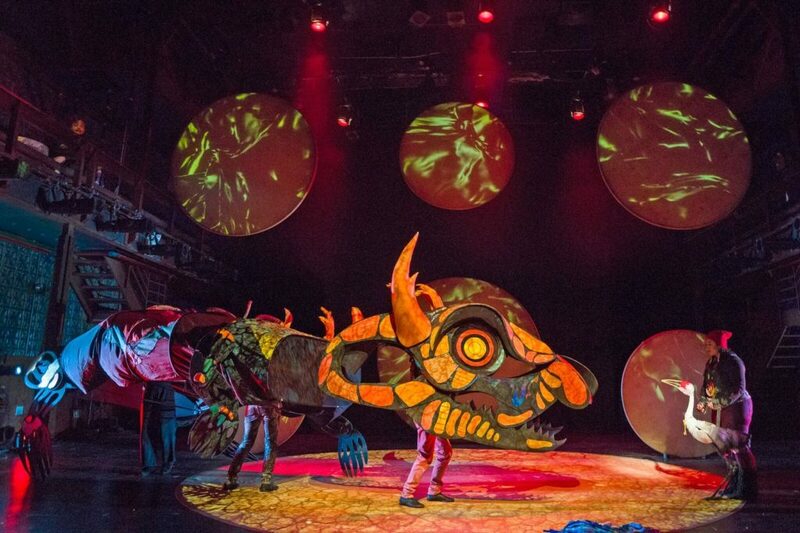 Review “Ajijaak on Turtle Island” (ChiPuppetfest): Captivating!! 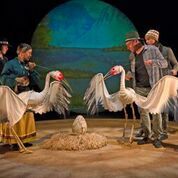 Chicago International Puppet Theater Festival*, in partnership with America Indian Center, presents IBEX Puppetry’s AJIJAAK ON TURTLE ISLAND. ChiPuppetFest kicks off with a first-ever First Nations puppet tale. AJIJAAK ON TURTLE ISLAND is the story of a baby crane. After Ajijaak is separated from her parents, she is forced to migrate on her own. During her journey, Ajijaak makes friends and learns valuable lessons about giving back to the earth. The heart-warming folklore is made captivating by Heather Henson’s IBEX Puppetry. This show is a visual stunner! The puppets are amazing! This crane-coming-of-age story follows Ajijaak from being hatched to wobbly toddler to soaring spirit. From her birth, the audience is tethered to her happiness. Large suspended circular screens help guide us through her journey with landscape projections (designer Katherine Freer). Her transformation, physically and emotionally, is the heart of the show. Under the masterful co-direction of Henson and Ty Defoe, the cast (Tony Enos, Joan Henry, Wen Jeng, Adelka Polak, Sheldon Raymore, and Henu Josephine Tarrant) seamlessly transition from puppets to humans to objects to stagehands. They bring personality to their puppet counterpart as a vulnerable crane or a cool dog or colorful buffalo. The person magically disappears into the puppet. The blurring of human and animation is mesmerizingly breathtaking. In one sequence, they bring out several trees as scenery (designers Christopher Swader & Justin Swader). Two of the ensemble seem to be moving branches around. They connect their sticks and suddenly, an elegant deer is ambling in the forest. When the cast billow shimmering aqua fabric, we are oceanside. When they whip flames around, we narrowly escape a fire. 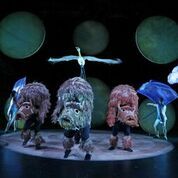 Although this terrific cast also perform well as humans, especially in First Nation traditional dance and song segments, the puppets steal focus. ChiPuppetFest promises that performances will astonish and delight. AJIJAAK ON TURTLE ISLAND sure does. The spectacle is for children and adults of all ages. There are only four shows left! I highly recommend seeing AJIJAAK this weekend. Alternatively, following this weekend’s run in Chicago, AJIJAAK ON TURTLE ISLAND will have performances in Baraboo, WI (January 24-25); FirstWorks Frontier Series in Providence, RI (January 31-February 1); and New York, NY (March 1-10). 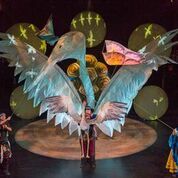 *The 2019 Chicago International Puppet Theater Festival will present more than 80 performances of 24 shows from 11 countries over 11 days at 19 different Chicago-area venues.